After getting shipwrecked on a mysterious island during her first-ever archaeology expedition, Lara finds herself in one life-or-death situation after another. Her crew is missing, and the island's cult-like inhabitants are eager to kill her. The narrative's dark, distressing tone is established right from the start, and never once does it stray during Tomb Raider's 15-hour campaign. This consistency builds a great deal of tension and intrigue, and you'll be eager to keep playing to see what happens next. Throughout the game, you're tasked with solving elaborate puzzles and taking on sporadic groups of enemies; in addition to plenty of platforming and exploration. After you finish Tomb Raider's long-winded tutorial, it easily rivals the best Uncharted has to offer--and that's not a claim made lightly. Where Uncharted props itself up on Nathan Drake's charm, platforming prowess, and ability to shoot dudes in the head without getting bummed out, Tomb Raider's foundation is one of excellent pacing, and an ominous story of survival. The development of Lara's character is an integral part of that experience. She's a far cry from the stylish adventurer you used to know. In the stead of a dolled up gunslinger is a do-what-it-takes female lead who's intelligent and capable. 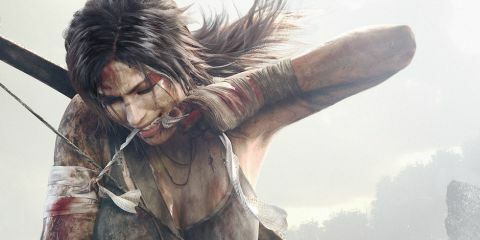 It's unsettling to watch her brave some truly disturbing situations--at times, Tomb Raider is more survival horror than action adventure--but she deals with it because death is the only alternative, culminating in her gratifying evolution from a green explorer to a seasoned survivor. It's a shame that caliber of character development doesn't extend to the supporting cast. Her shipwrecked friends are pretty generic characters who, while rarely annoying, just aren't memorable. But what those characters lack in magnetism is more than made up for by the incredible personality and mystery of the island setting. It's a bizarre place filled with ancient shrines, World War II-era bunkers, and all sorts of relics and trinkets spanning multiple centuries. It's always clear that something strange is going on, and the island's secrets tease you right up until the very end. You explore a huge variety of environments, sectioned off into hub-like zones, all of which give clues that help you uncovering the island's overall enigma. From underground ruins and snow-laden mountain tops to lush forests and grim oceanside cliffs, no one area ever feels like a rehash of another, and the sheer amount of detail in each is impressive. So, you want to know about The Definitive Edition on PS4 and Xbox One? Well, for starters the game looks prettier. Not massively better, but better nonetheless. The frame-rate is higher and more consistent, making combat and platforming feel smoother. The Lara character model has been reworked, and her hair now flops about more realistically. Looks nice, but adds nothing to the game. Voice commands now let you access the map, and change weapons, while audio diaries now play through PS4's controller speaker. Unfortunately, there's no way to stop them playing through the TV too, so you get an awful echoing effect. During Lara's journey, you encounter plenty of dangers. Traps, hostile cultists, and vicious animals alike will stand in your way. Nearly every battle feels like an intense fight to the death instead of just another shootout, despite the fact you rarely encounter more than five or six enemies at a time. The bad-guy AI is great for the most part, as foes will kick over tables to form barricades or shoot off flares to call for help. Best of all, they often react realistically to your shots. Cap an enemy in the leg, for example, and he'll go down to the ground where you can finish him off with a melee execution. Usually a climbing-axe to the skull. Nasty! Lara's inexperience shows through early on, as her shots are inaccurate and weak. By defeating enemies, solving puzzles, and finding the many collectibles hidden on the island, you gain experience points and resources for upgrading Lara's skills and weapons. Other games that try to emulate the growth of an unseasoned character don't pull it off with quite the same aplomb as Tomb Raider does--by the end of the adventure, Lara's transformation into a powerful heroine is noticeable, and feels natural. But Tomb Raider isn't all about fighting. It's totally common to spend five minutes exchanging fire with a group of enemies, then go 45 without seeing a soul. These breaks in battle are filled with great platforming segments, clever puzzles, and adrenaline-pumping set piece moments, and the pacing throughout is unrivaled by any other game in the genre. Even the rate at which Lara obtains new weapons and equipment--like rope arrows that open up new sections of some zones on the island--is admirable, as you snag new gear right up until the final chapters. Tomb Raider's single-player campaign alone is worth the price of admission for new-comers, but its multiplayer component will be a welcome addition for those looking for a bit more longevity. Multiplayer maps are filled with climbable ledges, zip lines, and level-specific traps that are perfect for scoring easy kills. There are some pretty decent modes to keep things interesting for awhile, too, such as Cry for Help in which one team must capture a series of control points before the other kills and loots 20 players. That said, the multiplayer doesn't feel as genre-defining as the campaign, as it doesn't really introduce anything new to keep you interested after a dozen matches or so. Even if you've never been a huge fan of Lara Croft's fortune-hunting adventures, Tomb Raider is sure to impress. Its expert sense of pacing, captivating setting, and dark tone create a truly memorable experience that's further enhanced by an immense level of detail. Lara Croft, the old Lara Croft, is dead. In place of a dolled-up gunslinger is a do-what-it-takes survivor--and I hope she hasn't had her fill of adventuring just yet. Is the Definitive Edition worth buying? The improvements are too subtle and gimmicky for me to recommend that experienced Tomb Raiders--people who have already finished the game on PS3 or Xbox 360--drop $50 / £40 on the next-gen version. However, if you own a PS4 or Xbox One, and you haven't yet experienced the new Tomb Raider, then you should leap any chasm and murder any hired merc who stands in your way until you've got this playing on your console... It's still brilliant, and the Definitive Edition is the superior version. One of the best adventure games on console, with a fantastic blend of action and exploration. The Definitive Edition really is definitive, but isn't worth a repeat buy for those who've already experienced Lara's story. Description Lara Croft is getting a new lease on life with this grittier reboot.